What do i need to bring on fishing trip? Rain gear – just in case, fishing boots, big brim hat, sunglasses, sweater, sunscreen. License – if you dont have one, you can get a one day at the landing. $15, I think. Galley – The boat serves burgers, burritos, breakfast, beer, soda & water. Plan on $20 to 40, plus tip for the galley. Depends on your appetite. Fish processing – the boat will clean & filet your fish at a reasonable per fish rate. Plan on $10 to 20 depending on how lucky you are. You can also take your fish home whole without processing. Crew & captain tip – what you tip is up to you, but we recommend at least $20. The dues are $35 a year. Add $10 for a family membership. After June 1st, the cost is discounted to $20 & $30, respectively. We meet on the third Wednesday of every month at 7:30 p.m. at Lulu’s restaurant near Roscoe and Balboa. I’m sure if you ask our members, you will get a variety of answers. Here is mine … being out on the sea with beautiful ocean and island views helps me unwind in a way unlike any other – it recharges me for the upcoming week of work, LOL. Doing it with people that I know, like & trust makes it all that much better … not to mention safer. Did I say that I love fishing? I need to fish more. I overheard another member say that they do it for the camaraderie. There is that for me as well. Some might say it’s just see the president dress up as Gene Simmons at the annual banquet. 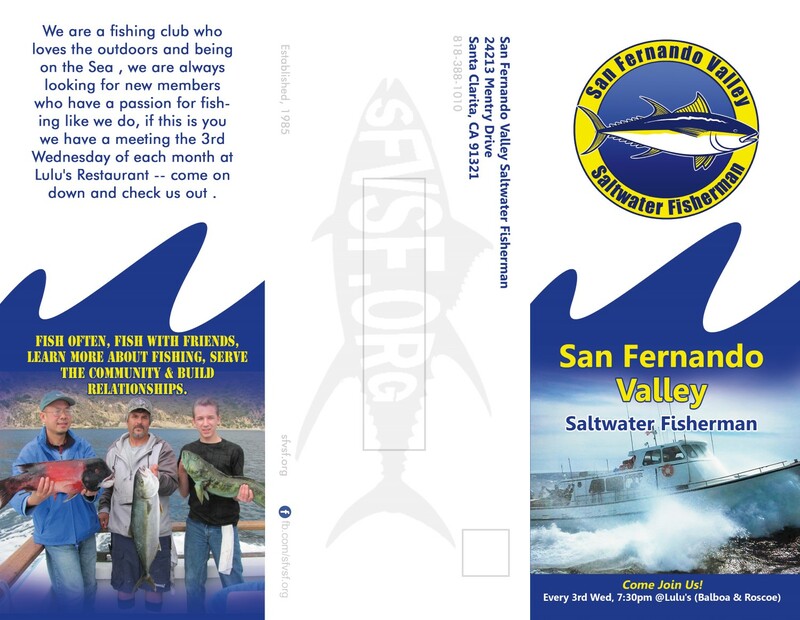 Fish often, fish with friends, learn more about fishing, serve the community & build relationships. You join up and you come to the meetings, make some friends and you fish when you can. We provide monthly charters for you to join when your schedule permits. We also host other events such as barbecues and the annual awards and installation banquet. We also participate in community service projects such as hosting the annual kids charter fishing trip. 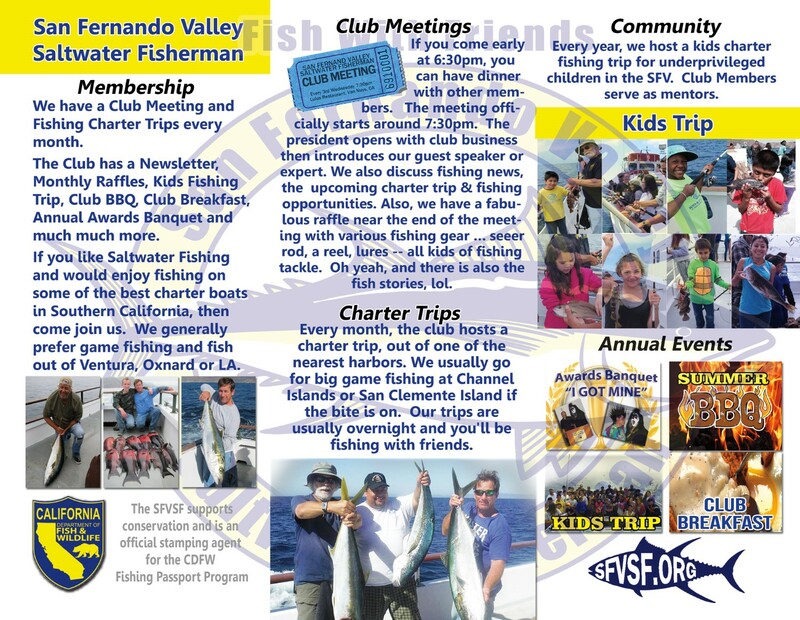 Every year, we host a kids charter fishing trip. Check out our Facebook pictures and website gallery for funtastic pictures of kids charter days. Yes, it’s free to visit a meeting as a first time guest. Ok, maybe a 2nd time too; however, we encourage you to join the club on future visits. Names, phones & addresses of landings. You can click the Contact -> Join button or click sfvsf.org/join. Then, come to the meeting at LulusRestaurant.com on the next 3rd Wednesday at 7:30pm. If you come early at 6:30 p.m., you can have dinner with other members. The meeting officially usually starts around 7:30 p.m. where we introduce a guest speaker to talk about saltwater fishing in Southern California or related topics. We discuss fishing news, the upcoming charter trip & fishing opportunities. Also, we have a fabulous raffle near the end of the meeting … with raffle off various fishing gear…rods, reels, lures, line, weights, boxes, shirts, hats, etc. Oh yeah, we also tell fish stories, lol. Yes, new visitors are always welcomed. Fishing with friends is the whole idea, right? Additionally, you can bring guests on charter fishing trips. What if I don’t fish that often? Even if you fish once or twice a year, you will benefit from fishing with at least 10 experts that already know you. We have some members that only fish a couple times a year. How often you fish is up to you. I just got elected to the board of directors, what do I do? Show up at Las Hadas every 1st Wednesday of the month at 7pm — go at 6pm to have dinner and hang out with the board members before the meeting.